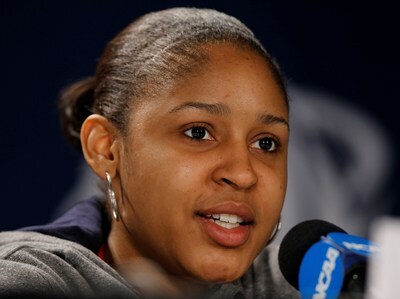 *Maya Moore, the UConn hoops star who helped her team win a record 90-straight games and also led the school to two national championships, was just selected by the Minnesota Lynx with the first pick in the WNBA Draft. The four-time All-American averaged 22.8 points this season and 19.6 during her career. She was also the only collegian to play on the U.S. women’s national team that won the gold medal at the world championship last October. Moore is the second straight UConn player to be taken with the first pick in the draft. Tina Charles went to the Connecticut Sun last season and earned the league’s rookie of the year honors. The Lynx finished 13-21 last season and won the draft lottery.